Principal structures (B. Hasselblatt, A. Katok). Entropy, Isomorphism and Equivalence (J.-P. Thouvenot). Invariant measures for hyperbolic dynamical systems (N. Chernov). Periodic orbits and zeta functions (M. Pollicott). Hyperbolic dynamics and Riemannian geometry (G. Knieper). Topological Methods in Dynamics (J. Franks, M. Misiurewicz). One-Dimensional Maps (M. Jakobson, G. &Sacute;wiatek). Ergodic theory and dynamics of G-spaces (R. Feres, A. Katok). Symbolic and algebraic dynamical systems (D. Lind, K. Schmidt). Homogeneous flows, applications to number theory, and related topics (D. Kleinbock, N. Shah, A. Starkov). Random transformations in ergodic theory (A. Furman). Rational billiards and flat structures (H. Masur, S. Tabachnikov). Variational methods for Hamiltonian systems (P.H. Rabinowitz). Pseudoholomorphic curves and dynamics in three dimensions (H. Hofer, K. Wysocki, E. Zehnder). 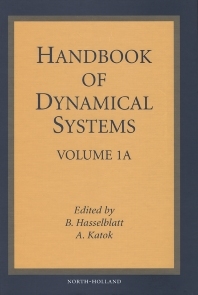 These volumes give a comprehensive survey of dynamics written by specialists in the various subfields of dynamical systems. The presentation attains coherence through a major introductory survey by the editors that organizes the entire subject, and by ample cross-references between individual surveys. The volumes are a valuable resource for dynamicists seeking to acquaint themselves with other specialties in the field, and to mathematicians active in other branches of mathematics who wish to learn about contemporary ideas and results dynamics. Assuming only general mathematical knowledge the surveys lead the reader towards the current state of research in dynamics. Volume 1B will appear 2005.